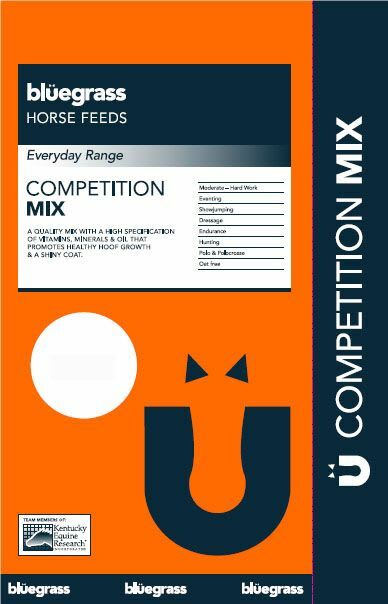 Bluegrass Competition Mix has been formulated to provide optimum nutrients to support the performance horse throughout training and competitions. Enriched in high quality vegetable oils and super fibres for source of slow release energy to increas stamina and power. There alternative energy sources reduce a high grain content and promote a healthy coat and condition. Fortified in bioplexes to enhance nutrient availability and aid muscle function. Vitamins and minerals are an essential part of the performance horse diet to support rapid recovery and repair after competition, helping to minimise the risk of injury. High quality proteins also support recover, essential amino acids are the "building blocks" to support soft tissues such as tendons and ligaments and aid the repair of cells. Bioplexes which enhance absorption and availability of nutrients, and aid effecicient muscle function.